A new addition to the America's Army shooter franchise is coming this year. I had no idea that America's Army was still a thing, and in my defense it's been nearly four years since the last entry in the series, America's Army 3, was unleashed on the shooter world. 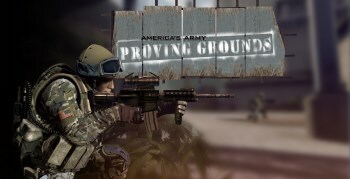 But it is still a thing, and a new one is coming, entitled America's Army: Proving Grounds, in which you will presumably prove that you have what it takes to be in America's army and then (I'm guessing) head down to your local recruitment center to sign up to be all that you can be, or whatever they're calling it now. Because that is, after all, what this is all about. The America's Army games are rated Teen by the ESRB and as such they've come under fire several times over the years, including from actual Army veterans, for working their recruitment hoodoo on underage gamers. The America's Army website features a prominent link to the U.S. Army site and while I don't know if anyone has determined just how effective a tool it actually is, the Chinese saw enough potential in the idea to come up with a similar game of their own. In any event, beta registrations are now being taken and while there's no sign as to what will get you into the club, the America's Army Facebook page says the game will be out later this year, so I imagine they're not going to be too picky about it.